Diviya and Sumit said "I do" with enchanting nuptials filled with floral beauty! Planned by Elegant Events, the day's celebrations began with a gorgeous outdoor ceremony at Hyatt Regency Newport Beach that featured stadium-style rows of seating for their hundreds of guests to witness the traditional vows. Dreamy all white draping framed the ceremony space and set the tone for the elegant event while vibrant orange, pink, and blush florals and lush greenery added pops of color to the design. Our bride and groom solidified their union under crystal blue skies surrounded by loved ones and it could not have been more beautiful! 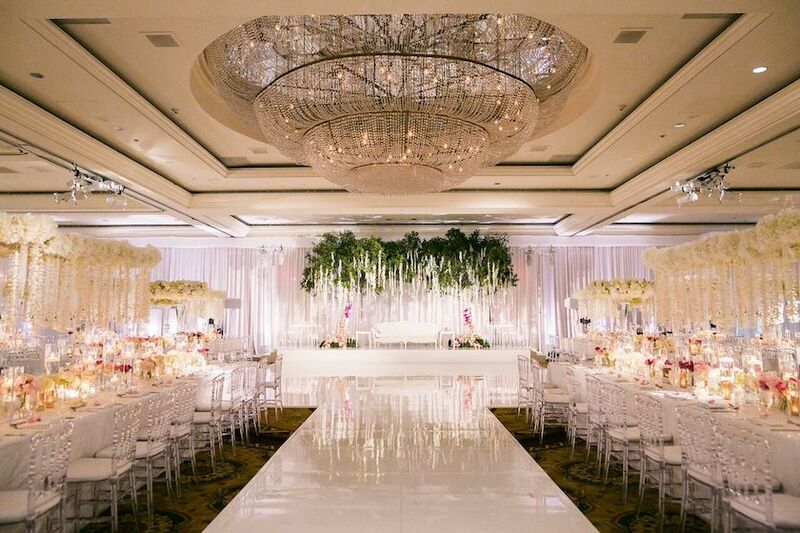 Following the ceremony, the celebration continued at The Duke Hotel Newport Beach where a stunning reception awaited. The ballroom was transformed into a luxurious oasis of beauty with all white decor and gorgeous lighting filling the room. Combinations of rectangular and round tables were topped with tall centerpieces full of powdery white blooms and subtle pink accents. An all white walk way through the center of the room led to the dance floor and raised platform where the bride and groom would enjoy their reception from a luxe white seating vignette that was framed by a backdrop of hanging greenery. We were thrilled to be part of Diviya and Sumit's dream-like wedding with an incredible team and love reliving the day through Lin & Jirsa Photography's beautiful images!